If you’ve got a mouse infestation in your home or apartment, you’ve got a problem. Mice may be small, but they can spread diseases, eat your food and damage other materials found around your living space, and breed very quickly -- thus making an infestation problem harder and harder to control the longer you wait. However, there are a number of solutions to this problem; some are more expensive than others. This article will outline some options that you can use to take your home back from these tiny pests. Use live box traps or glue traps. Box traps will provide a one-way entrance for mice, ensuring that they are attracted in by the promise of food but cannot get out. This tends to be a good option for people who do not want to deal with dead or near-dead mice. You will, however, need to check -- and empty -- box traps regularly to use them most effectively. Glue traps are a little more gruesome; the mouse gets stuck in the glue until you find and remove them, or let them die in the glue from lack of food. Whichever method you use, be safe! Since mice can carry diseases, use caution (plus rubber gloves, bleach to clean the trap areas, and a dust mask) when dealing with the disposal or outside release of trapped mice. Use old-fashioned spring traps. Few people have actually “built a better mousetrap” over the years for one simple reason: spring traps work exceedingly well at catching (and often killing) mice. Although these traps are deadly to mice -- especially if you place a bit of food on the trap -- they can also be harmful to curious children and pets, so only use this method if your household has neither. Try more “natural” methods of pest control, as some are surprisingly effective. We’ve covered these methods in-depth; for people who take “green” living seriously, some of these methods might be worth trying before resorting to more conventional (and deadly) methods. Use rodenticide. 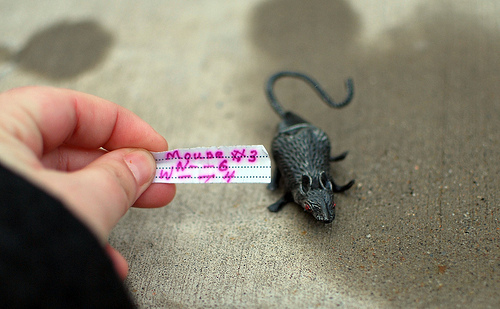 Commercial rat poison is very effective, but it can get messy. It does not kill mice instantly -- and does so by affecting the rodents’ blood clotting ability -- so if you want to use this method, be prepared to clean up some mouse carcasses up to five days after you set out the pellets. Since mice can squeeze into tiny spaces thanks to their size, check your home and its small spaces carefully for carcasses so that the smell of decay does not also become a problem. Due to safety concerns, this method also works best for homes without children and/or pets. Hire a professional exterminator. When you’ve exhausted the other options but need your rodent freeloaders gone for good, it may be time to hire an exterminator; this is usually the most costly option in terms of both money and preparation. Any exterminator or pest control company will send you a list of pre-extermination prep work that needs to be accomplished before they can come in. Typically, this work encompasses things like airtight food storage, and some DIY repair of any holes or cracks in baseboards, doors, walls, and floors where mice may be getting in. If you are renting a home or apartment, your landlord, management, or maintenance crew should take care of the DIY repairs pre-extermination session; depending on your lease agreement, they may also be responsible for the cost of the extermination as well. Homeowners, meanwhile, will be responsible for all of the pre-extermination preparation work, repairs, and miscellaneous things that need to be done before the exterminator can do his or her job.